Would you look at that… It’s MAY FAVOURITES Time!! Reviving foot spray from Boots. Okay, as we all know, pretty much the majority of girls like to shop.. but what is the one thing that we all (or well I do anyway) complain about when we get home from that huge shopping spree? Yes… our feet. Recently, I picked up this refreshing foot spray from Boots.. which smells really fresh and minty and cools down my tired sore feet. With ingredients such as mint, witch hazel and cypress, your feet will be fresh in no time! Angelica nail colour: This month I’ve been all about the pastel and especially when it comes to nail polish.. I picked up this bad boy in Pennys (Primark) for a mere 2.95 and I have fallen in love. The colour pay off is amazing and comes up so strong with only one application. It’s also really really longwearing. Definitely gonna be picking some more colours up soon! Soap & Glory’s Flake Away body scrub. This is actually an old favourite of mine, I used to use this all the time and I have now recently rekindled that love. This scrub is nothing short of a miracle. It exfoliates my skin without irritation and it smells DAYUM good. You get a pretty huge tub with a LOT of product and it lasts you a hellova long time. I have a feeling this will be in my June Favourites as well. John Frieda Frizz-Ease Hair serum: I actually picked this product up about 2 years ago in an attempt to calm my ever frizzy hair. I loved it but I found it to be a tad bit too greasy. HOWEVER, I have recently started dying my hair again which means that my hair has been that bit more dry and in turn more frizzy. I salvaged this product out from one of my drawers and thought id give it a go. It’s now one of my most used products. I have a full sized and a mini sized one for my bag. You need the teeniest little amount and I just run this through the ends of my hair.. to attack and tame that annoying frizz. The Body Shop’s Mango Body Mist (new): This was actually one of the products that I was lucky to receive in the goody bag I was given at The Body Shop event I attended last month. Mango being one of my favourite scents, I was certain that this mist would be a good’un.. and I wasn’t wrong! I love the fruity scent and I find it perfect to use in between those perfume applications during the day to keep you smelling lovely. It’s the perfect summer scent and for a few minutes you can pretend you are off somewhere lovely,warm and exotic.. #wishfulthinking! Previous postViviscal Giveaway Winner! Hurrah! 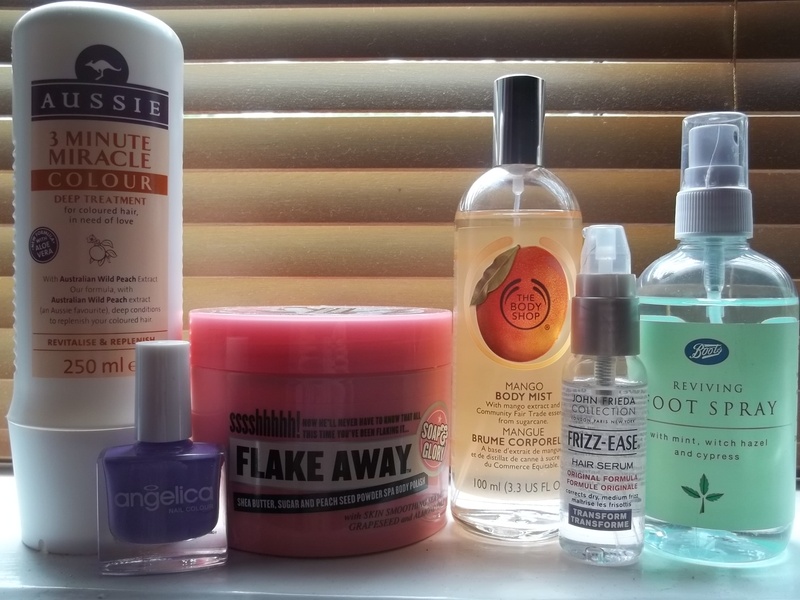 Really want to try the mango spray, I can’t stop using the satsuma one! Ooooh the satsuma one sounds lovely! I have the coconut one too.. it’s gorgeous.. but can be really overpowering! That nail polish color looks perfect for this time of year! Very fun! And nearly anything from the body shop is amazing! Hey! Thanks for Following Natural Beauty Know How. We have a lot of great articles in the pipe line so stay tuned. All the best.